India is a land full of wonders; wonders that will amaze you, attract you, and leave you wanting for more. 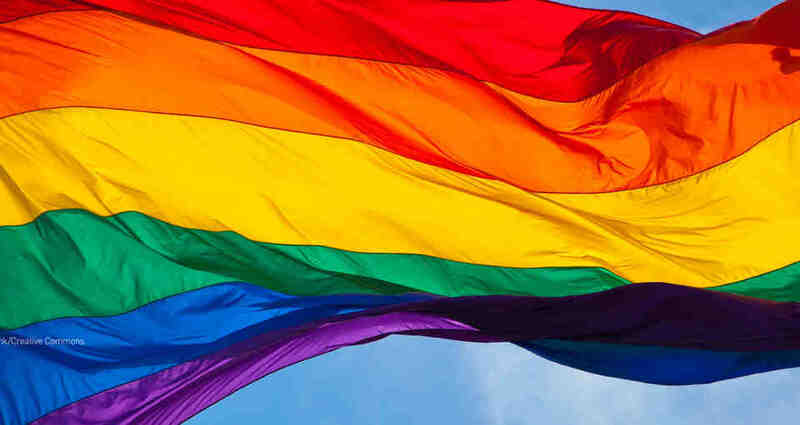 Beyond the cacophony of sounds, the tease of flavors and the bustling of crowds, there is an innocent nation, where tourists explore not only the diversity but themselves as well. 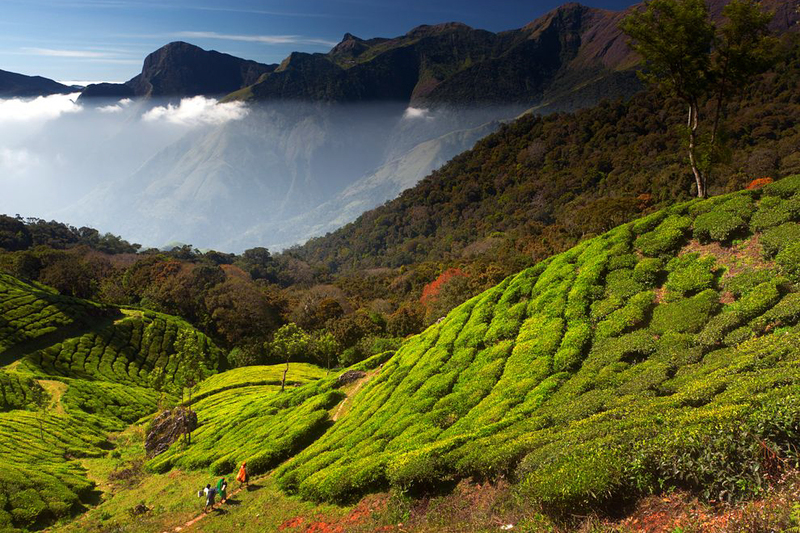 As a tourist destination, India draws a beautiful contrast of chaos and calm, forests and deserts, and history and mystery. Every ounce of the country will embrace you with a charm that will leave you in awe. You will always find something that will feed the wanderlust in you. And waterfalls in India are no different! The view of cascading waterfalls falling from high slopes, and cuddling into the river flowing at its feet, makes for a therapeutic sight. Let’s take you on a virtual tour of these massive waterfalls that the country is home to. 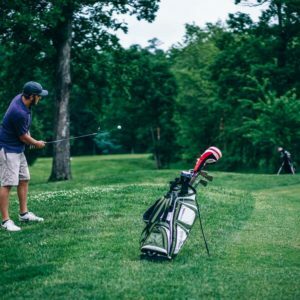 The beach paradise of India, Goa, has a long list when it comes to attractions. 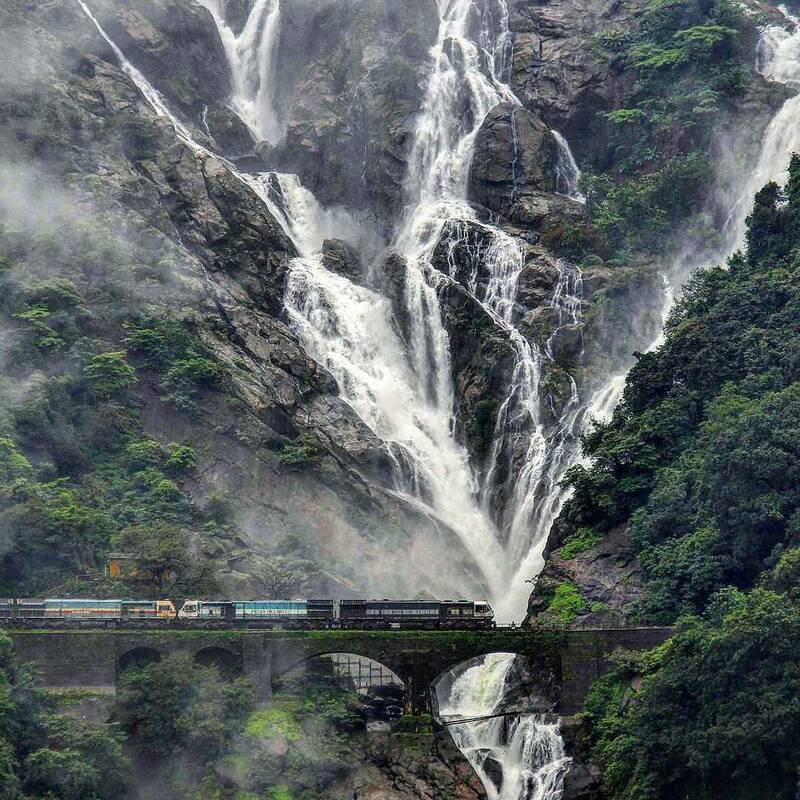 With endless beaches ready to be explored, this mesmerizing place is also famed for its Dudhsagar Waterfall. Translating to ‘ocean of milk’, this waterfall takes a trip down the hills from 320 meters of height and looks absolutely magnificent. The waterfall makes for a visual treat with its transformation in the water colour from blue to white as it crashes to the bottom. It is the 5th largest waterfall in India, and can be best enjoyed at the peak of the monsoon season, when the river is at the highest flow. 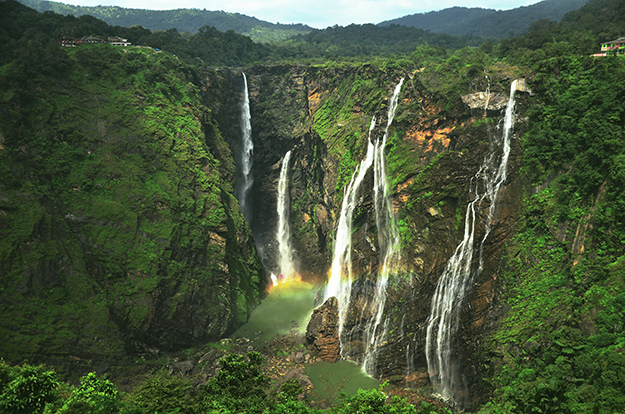 Moving towards the south, Jog Waterfall in Karnataka is beautifully nestled in the lush green surroundings of Shimoga. An interesting feature of the waterfall is not its height but rather its width. With a girth of 290 and a height of 259 meters, the waterfall is a sight to behold. 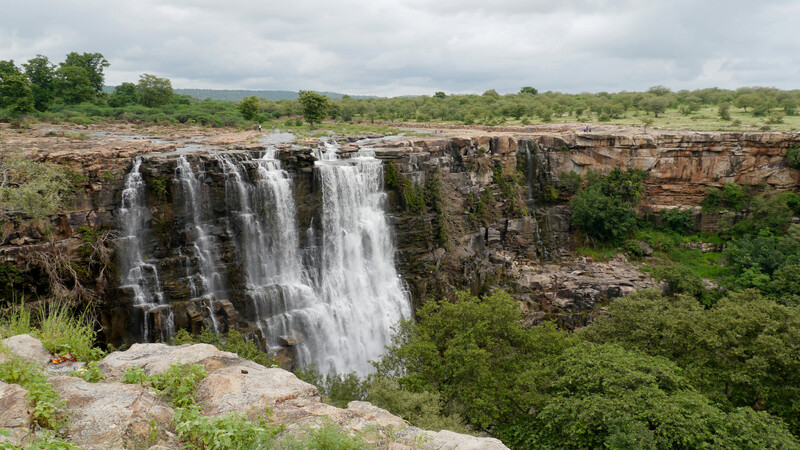 It is also known by the names Gersoppa Falls and Jogada Gundi, by the locals. The fact that it is the second biggest waterfall in Asia, makes it a must see. This unique waterfall is also known as the Nohsngithiang Waterfall. 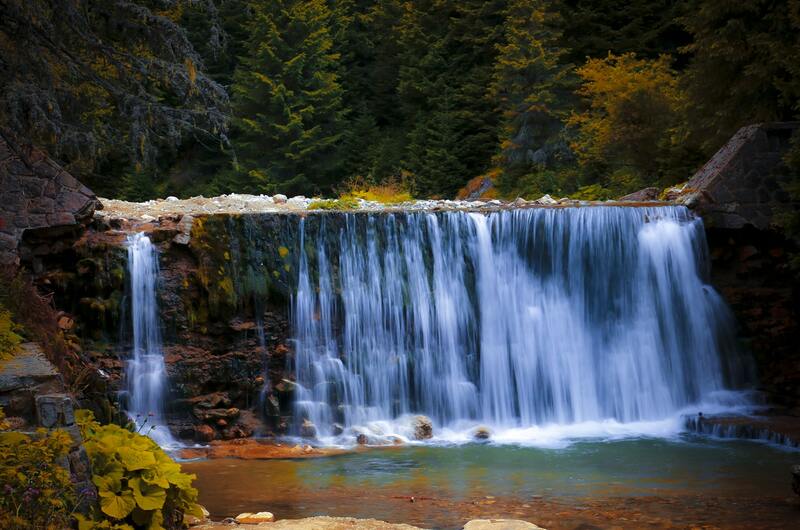 There are seven streams falling from the same source, which is what makes this waterfall a wonderful art of nature. 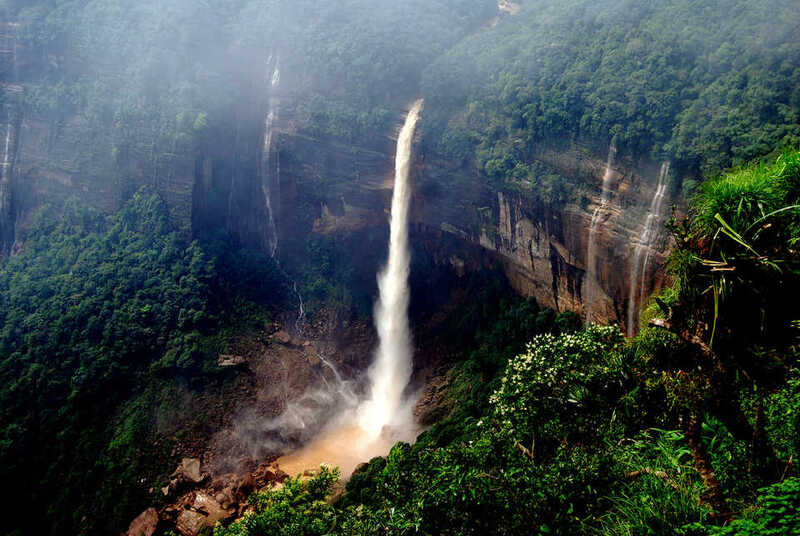 Located just 1Km from Mawsmai Village in the East Khasi Hill District or Meghalaya, Nohsngithiang Waterfall is 315 meters high with a girth of 70 meters. This makes this waterfall the 4th biggest in India. Sunrise and sunset make for the perfect visit to the Waterfall. Nohkalikai is also a priceless possession of Meghalaya. It is perhaps the most spectacular looking plunge waterfall that the country has. Nohkalikai is also one of the tallest waterfalls in the country. The natural splendour of the waterfall makes it all the more fascinating. Water babies should definitely visit it and take a plunge in the large pool formed at its bottom. The serenity of this place can make any soul find peace and rejoice in its beauty. This stunning Waterfall in Kerala is India’s answer to the Niagara Falls in the USA. 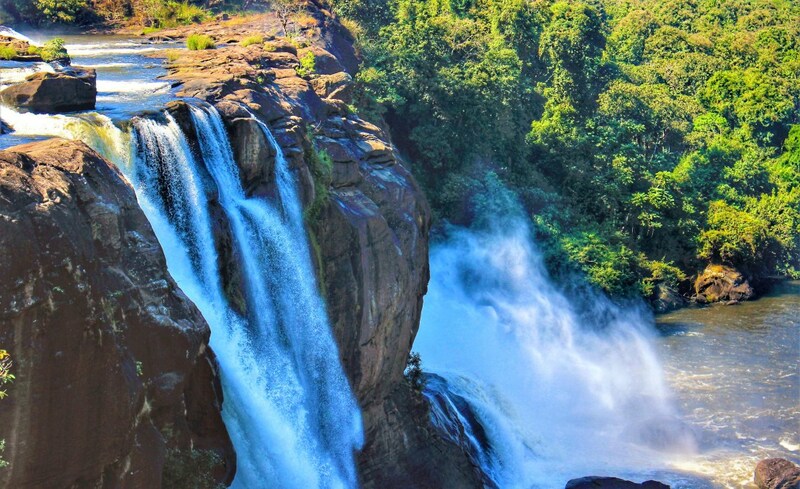 The Athirappally Waterfall is fed by the Chalakudy River, which results in a spectacular showdown. It is a relatively small waterfall, measuring just 24 meters, but the width of the fall is what makes it an attraction not to be missed. Being surrounded by exotic wildlife, like the endangered great Hornbill, makes this waterfall all the more attractive. The best of the scenic view of the Waterfall can be experienced during the monsoon, when the river is full. 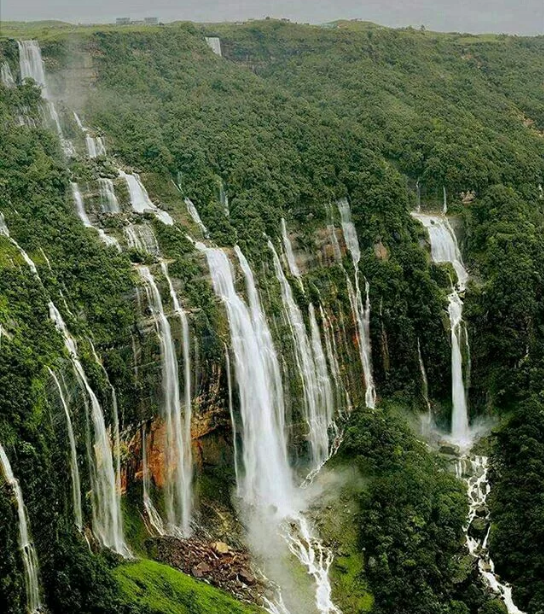 Experience one of the many beautiful wonders of nature with Arunachal Pradesh’s Jang Falls. Not just the waterfall, but the way to it is also quite interesting. One needs to trek a distance of about 200 meters from the power station to reach Jang Falls. 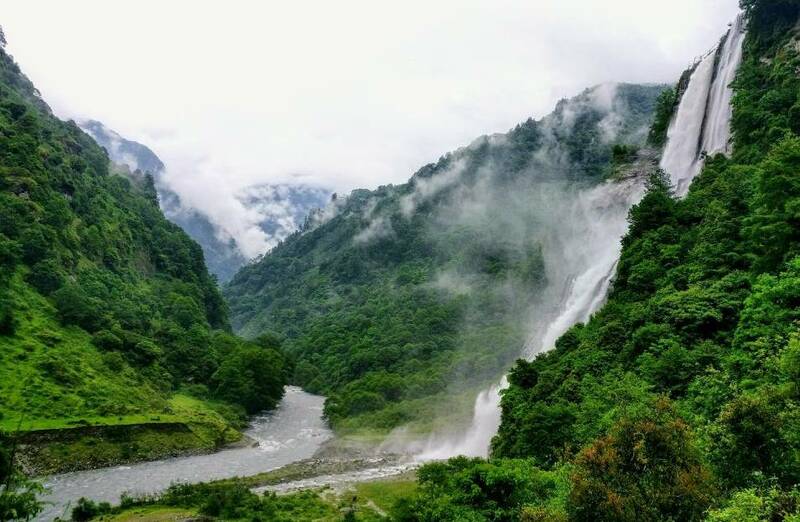 Located close to Jang Village in Arunachal Pradesh, these waterfalls not just serve as a tourist attraction, but also serve as the source of electricity for the people of Arunachal Pradesh. Major parts of Maharashtra have grown into a concrete jungle, but there are still few regions that take you in the lap of nature. 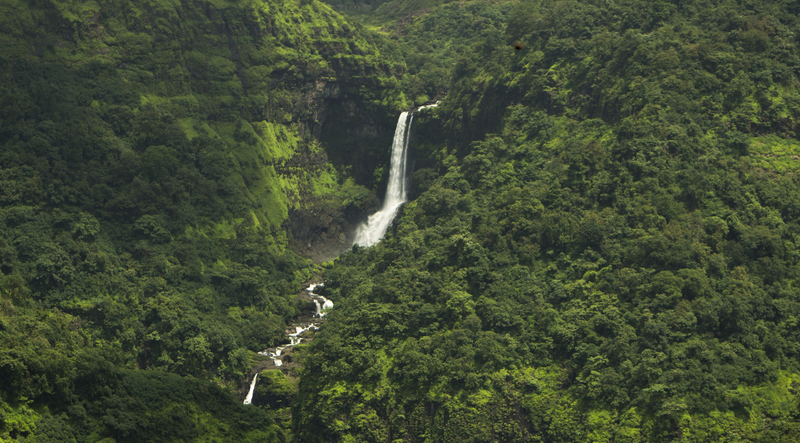 The Lonavala-Khandala region of Maharashtra boasts of several breathtaking waterfalls. Kune Falls stand out among the rest. These 3 tiered falls are 200 meters high, and offer a visually peaceful sight. Although you can only watch them during the monsoon season, when you do, you will be left amazed by their sheer beauty. A delight amid the desert land of Rajasthan, the Bhimlat Falls are like a well preserved secret of Rajasthan. It is hard to imagine that a land that is associated with sand dunes and hot afternoons can conceal something so contrasting. Bhimlat Falls crash that stereotypical imagery of Rajasthan. The Bhimlat Falls may just be 60 meters high, but the fact that they are located in Rajasthan make them worth visiting. 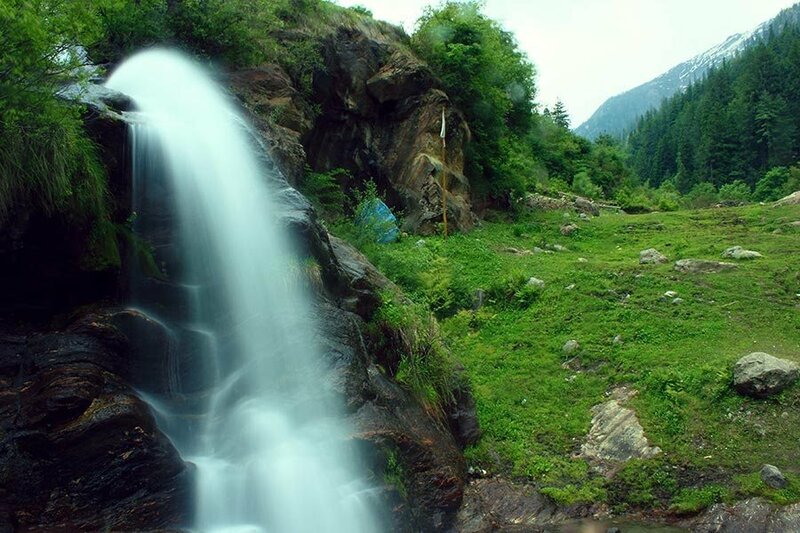 Residing on the route to the Kheer Ganga Trek, the Rudra Nag Falls in Himachal Pradesh is undoubtedly one of the most beautiful waterfalls of India. This eye-pleasing waterfall is a place that is hard to leave once bought into the vision. Just the entire tranquil aura of the Waterfall is such that you are bound to sit and admire the beauty that is in front of you. 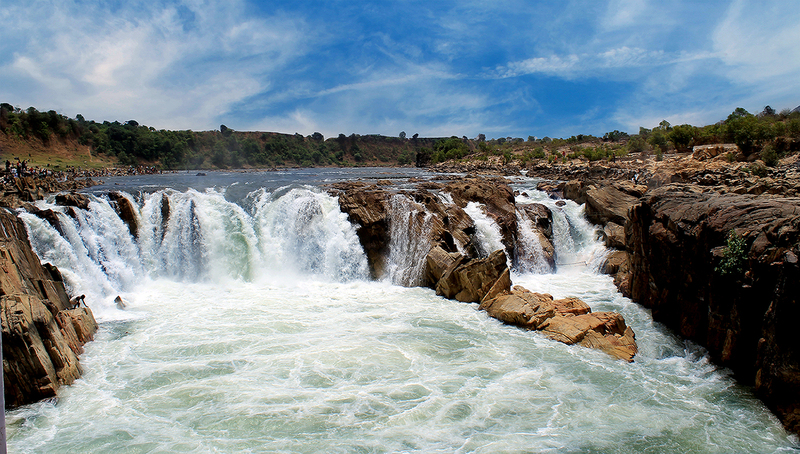 Also popular as the “smoke cascade”, Dhuandhar Waterfall is located 30kms from Jabalpur in the Bhedaghat district of Madhya Pradesh. As the name suggests, the flowing water of this beautiful waterfall gives off a smoke-like feeling that is enough to blow your mind off. The calm yet roaring, subtle yet loud waterfall is undoubtedly a stunning wonder of nature to experience. It is during the dry season that these falls are best visible as it is then that the unique crevasses of these falls can be examined. These waterfalls might not be the highest or the most voluminous waterfalls in the world, but there beauty is something that cannot be overlooked. Located in vivid regions, possessing different characteristics, there is still one thing that’s common about these waterfalls – their undeniable charm! !